An important role for protein kinase C (PKC) signaling in squamous cell carcinoma (SCC) of the skin has been recognized since the early 1980s, when PKC was discovered to be the major receptor for phorbol ester tumor promoters commonly used in mouse skin chemical carcinogenesis studies. 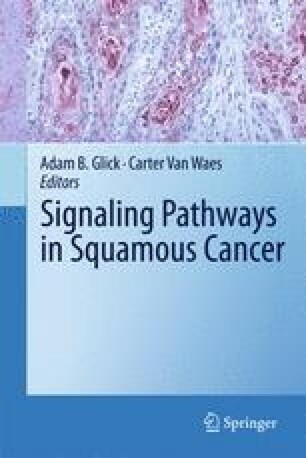 Since then, we have gained a tremendous understanding of the unique roles for different PKC isoforms in keratinocyte, KC, proliferation, differentiation, and apoptosis, as well as how PKC regulation and signaling integrate into the etiology of chemically induced SCC skin. In addition, the role of PKC in ultraviolet (UV)-induced cutaneous SCC is becoming appreciated. This is a significant development as human skin cancers are very common and are caused primarily by exposure to UV radiation. This chapter will summarize our current understanding of PKC function and regulation in normal KCs, as well as the etiology of both chemical and UV-induced cutaneous SCCs. I have permission to use all figures in my chapter because they are originals.